Police had initially detained 33 people out of which 14 were arrested late on Wednesday night while others were allowed to go. Fourteen AAP members were arrested after Delhi Police registered an FIR in connection with the clashes outside the BJP national headquarters here between supporters of the two parties that left 28 people injured. According to police sources, an FIR has been lodged at Parliament Street Police Station on Wednesday night against the AAP protesters including leaders Ashutosh and Shazia Ilmi. Charges of rioting, obstructing a public servant from performing his duty and damaging public property have been slapped against them, the sources said. Police had initially detained 33 people out of which 14 were arrested late last night while others were allowed to go. “All those indetifiable and present at the protest site have been named in the FIR,” said a senior Delhi police official. Those arrested will be produced before a local court here in the afternoon. 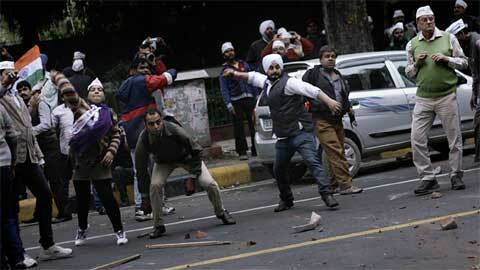 28 people, including 13 AAP activists and 10 BJP supporters, were injured in the clashes, police said. Police have termed the AAP protest as completely illegal as no prior permission was sought in this connection by the party. Police have also got the entire sequence of events videographed and senior officials said that more arrests are possible after identification in the video footage. AAP workers had yesterday clashed with BJP activists outside the saffron party headquarters in Delhi and Lucknow after Arvind Kejriwal’s car was damaged in Gujarat in retaliation to protests against his brief detention in the state. Kejriwal, who began a 4-day tour of Gujarat yesterday, was yesterday detained for alleged violation of the model code of conduct by travelling in a long carcade. Shortly later, he was allowed to go. Accusing Narendra Modi of getting scared of Kejriwal and initiating police action, AAP workers had stormed the BJP head office on Ashoka Road in central Delhi protesting against Kejriwal’s detention in Radhanpur in North Gujarat where he has gone to “inspect” development that has been claimed by Chief Minister Narendra Modi. The rival sides had attacked each other indulging in pelting of stones. Plastic chairs were hurled from inside BJP office on the protesters outside.Police had used water canons to disperse the warring activists. In Lucknow, workers of Aam Aadmi Party, armed with brooms, had clashed with lathi-wielding activists of BJP and fought pitched street battles outside BJP office on Vidhan Sabha Marg in protest against detention of Kejriwal. Around three dozen AAP workers had staged a demonstration outside the BJP headquarters and allegedly attacked the saffron party office with bricks, drawing retaliation as BJP workers, carrying canes, took to the streets. Kejriwal had yesterday accused the BJP of instigating violence in front of its headquarters in Delhi even as he apologised for some AAP activists “retaliating” while protesting his detention. 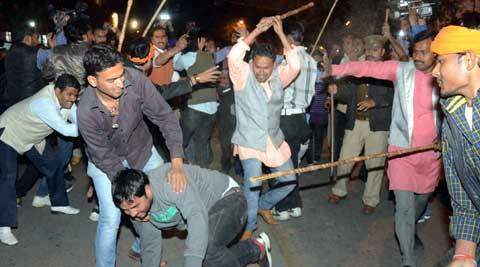 Kejriwal claimed that AAP workers were first attacked by BJP supporters. Some of the agitated AAP workers had responded by pelting “two or three stones”..
“I am sorry for the mistakes committed by the AAP workers. They should not have resorted to violence on my detention,” he said. He also blamed BJP workers for attacking his entourage while travelling in Gujarat and said the glass panes of his car were broken.